The people of Britain are waking up to the potential reality of the end of the United Kingdom if as recent opinion polls increasingly suggest Scotland votes YES for independence / dissolution of the union on September 18th 2014. This video answers key questions as to what would happen to both Scotland and the UK financially, economically and socially should Scotland vote YES, as the risks are far beyond that which many people have thus contemplated, far beyond just Scotland gaining independence but rather acting to blow itself and the United Kingdom apart. 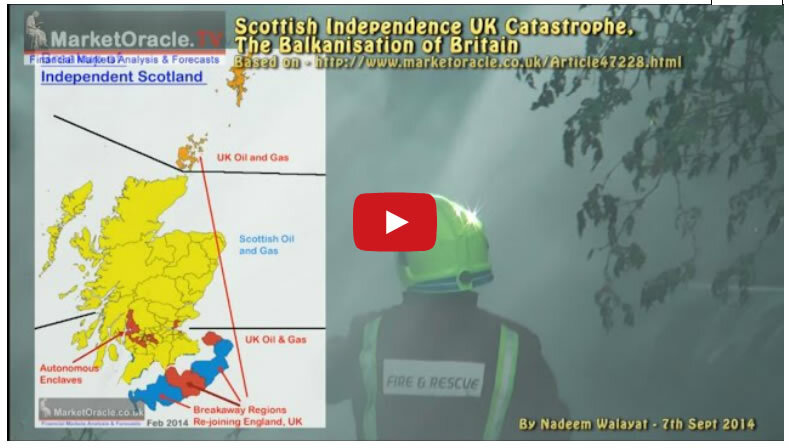 The video analysis concludes with the probable outcome of the Scottish vote that greatly differs to the 50/50 standing of current opinion polling that have contributed to much panic amongst Westminster politicians and the forex market. 11 Sep 14, 11:21 Scotland - Ukraine? What with Novorossiya extricating itself from the blood dripping clutches of the Nuland NAZI mob in Kiev and now a free and independent Scotland rid of the gone-to-seed, inbred WASP pirates, that pathetic appendage of USerland and City of usury and fraud. More good news than one can stand. One can hear the bums in the Brussels politburo decrying the surfeit of democracy as the €uro scam comes crashing down. How long before a free and independent Ulster reunited with Ireland, rid of the Unionist bigots from the 17th century ethnic cleansing carried out by the London mob? Onward then to Catalonia, the Venetto and soon, real soon, Palestine free of colonial squatters and freeloaders. Small is beautiful! All power must be devolved and local. In one breath you say one part of the Island of Britian should seperate from the rest, in the next breath you say that the North of Ireland should rejoin the South. Why do you keep comparing Scotland to England it is the United Kingdom not England. 91% haven't been given any say????? Why should they, they don't live in Scotland. If the UK has a referendum to leave the EU do you want the rest of the EU to join in that vote??? In 2011-12, for example, Scotland generated roughly £57bn in tax and had £64.5bn spent on it. But that extra spending isn’t a generous gift from the UK - it’s borrowing, taken out by the UK government in Scotland’s name. It’s not money from the rest of the UK, it’s money from international banks - it becomes part of the massive debt referred to above, and Scotland has to pay it back. "By early 2018 Scottish house prices will be 50% lower?? This is pure unsubstantiated assertion ,with no basis in fact. Pure surmise. You do realise that the Shetland Isles calling for independence was made on the first of April, do you not see any significance in that date? Did the date pass you by or like much else in this video did you just copy and paste off the Internet without examining and evaluating thoroughly.? But Alex Salmond says that he does not want to take on fair share of UK debt unless the he can burn the british pound by printing debt backed by UK tax payers. The bottom line is that Scotland functions with a HUGE subsidy from England that amounts to £1500 EXTRA public spending per head of population than England which is why University tutition is FREE in Scotland whereas in the UK students have to pay £40k! And an independent Scotlands house prices WILL crash, don't believe me ? We'll watch and learn.... Without banks there are NO mortgages! And no UK bank will take the risk of lending to a country without even a currency ! Please give a reliable reference for this "£1500 EXTRA public spending subsidy" I suspect it is just more unsubstantiated opinion. Not even the UK government supports that figure so I would be interested to see where you have conjured it up from. Furthermore one figure doesn't tell a story we need to see not just how much Scotland received but also how much Scotland contributed to the UK in the year you want to refer to. You have no proof of house prices crashing. Just saying watch and learn means it is only your opinion. House prices are governed by supply and demand not by whether a country is self governing or not. Where is the proof on which you base your opinions? Your concept that our country will have no banks is just ludicrous. Can you name me any independent country that has no banks? Again this is just pure surmise with no basis in fact. Our currency will be pounds sterling, this has been stated so many times it is becoming boring repeating it. Any country is free to use Sterling on the traded market and that is Scotland's intention. Actually its more like £1600 EXTRA. According to the National Statistics every Scots gets £10,152 spent on them, compared to £8,529 for the English, £9,709 for the Welsh and £10,876 for those living in Northern Ireland. Therefore England heavily subsidses Scotland, Wales and NI. It is all very well saying anyone can use the pound sterling, but the nationalists seem to gloss over the reality that they will be using a foreign currency the supply of which they have NO control. When they start trying to issue debt to fund all their utopian spending promises those sterling denominated bonds will not have the full faith and credit of the UK government or the BOE behind them. They may as well issue bonds in US Dollars or Euros, for the only thing backing them will be Scottish assets. In this way, Scotland will be asset stripped and/or will default Argentina style. An independent Scotland run according to the philosophy of Adam Smith could thrive, but an independent Scotland run by a bunch of socialist dreamers will crash and burn in double quick time. If Scotland votes yes, they will be in for a rude awakening as they realise the socialist utopia they have been promised does not exist.